badam laddu are quick, easy and tasty ladoos made with almonds, jaggery and raisins. heat a thick bottomed pan. keep the flame to low or medium and add 1 cup raw almonds. stirring at intervals, begin to roast the almonds. keep on roasting till the almonds become crunchy. just cool and taste a few almonds. but make sure you don't burn them or brown them too much. you can even roast the almonds in an oven. when the almonds have got roasted, add 2 tablespoons raisins and mix well. switch off the flame and remove the roasted almonds and raisins in another bowl or plate. let the almonds become warm. then add both almonds and raisins in a mixer or grinder jar. also add seeds from 3 green cardamoms. now add 1/3 cup powdered jaggery. you can even use palm jaggery, coconut sugar or cane sugar instead of jaggery. run mixie or grinder for some seconds and then stop. check the consistency. continue in the same way, till you get a fine consistency in the almonds with some oil released from the almonds. you can also use the pulse option in your grinder. you have to run the grinder in parts till a bit of oil releases from the almonds. take a small portion of the mixture in your hands and then press. it should hold shape and not crumble. don’t grind at one stretch or grind too much as then much oil will be released from the almonds and you will get almond butter. remove the badam ladoo mixture in the same bowl or plate in which we cooled the almonds & raisins. now take a small portion of the ladoo mixture in your palms and begin to shape it into ladoos. make badam ladoos with the rest of the mixture. this recipe yields 10 almond ladoos. the recipe can be easily doubled or tripled. store the almond ladoos in an air tight jar and refrigerate. 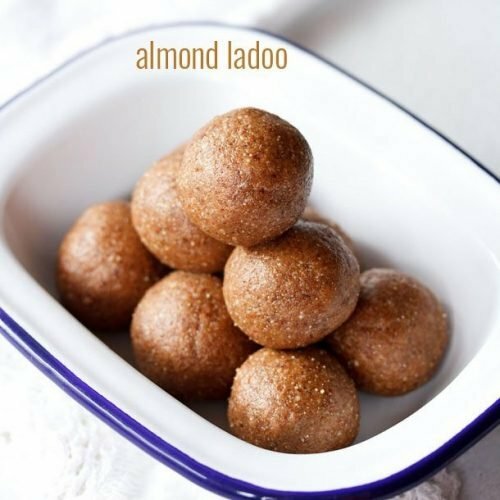 serve these healthy almond ladoos plain as a sweet snack.